Diabetes Week Statistics | Life, Sport and Diabetes - An everyday look at my life with type 1 diabetes. "Type 2 diabetes accounts for 90% of sufferers"
"Diabetes is the leading cause of blindness"
"3.8million people in UK have diabetes"
"1 in 20 have diabetes in UK"
"4 out of 5 with diabetes live in low-middle income countries"
Found above are some of the shocking statistics associated with the condition of diabetes as a whole. You may be aware of already and some may be new to you. However some others that aren't mentioned above are that according to the newspaper the Independent- 1 in 2 people globally is unaware that they could potentially have diabetes. And also that upto 80% of cases of Type 2 diabetes could be reduced or avoided if people were more aware that lifestyle changes such as a healthier diet and more exercise in order to have a healthier weight were followed. But in order for people who don't know they have the condition to be aware of it, more campaigning needs to happen to increase that awareness amongst the un-diagnosed. This year the charity for people with diabetes- Diabetes UK have been named as Tesco charity partner for 2013/2014. 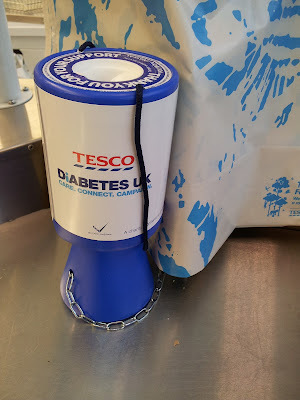 Within the year of the collaboration Diabetes UK will be the super-market retailers main charity, which means that fundraising and in-store campaigns will all take place in aid of people with diabetes. Together the partnership is hoping to raise 10 million pounds, large proportion of which it is hoped will go towards research into treatments, a cure and preventative measures. One preventative measure being created in the lab by scientists at the moment is the 'diabetes vaccine'. Although the term vaccine sounds like a pre-diabetes jab to have before getting it. At the moment researchers appear to be working on a vaccine that is given to people who are in the early stages of developing type 1 diabetes. When someone is diagnosed with diabetes the condition can be characterised as Type 1 because our pancreas' stop producing insulin all together- insulin being the hormone that regulates blood sugars. However, there is an amount of time that health care professionals call the 'honey moon period' where by the body still produces some insulin. But not enough to regulate blood sugars as normal. And it's during this period that scientists believe that if they deliver the jab, they maybe be able to catch the cells in time before they start destroying anymore of the pancreas. In my opinion this is a step in the right direction, because if the vaccine works and we can raise enough awareness around the symptoms of Type 1 diabetes such as those featured in the 4t's campaign. Toilet, tired, thirsty and thinner-then although we won't be curing the people who have had the condition for years we may be able to stop and reverse it in those on the brink of diagnosis. And as I mentioned in the previous blog 'Why is Research Important', quite often one scientists research can help inspire the next ones so we may still find ourselves closer to a cure through this research anyway.